Missy just happened to be at the humane society one day and noticed a litter of six kittens in the euthanasia room. The kittens were about four weeks old, very sick with severe upper respiratory and eye infections and only minutes away from being euthanized. Missy thought these kittens could be saved, so she sprung into action. She took them home with her and contacted her friend, Lori, for help. 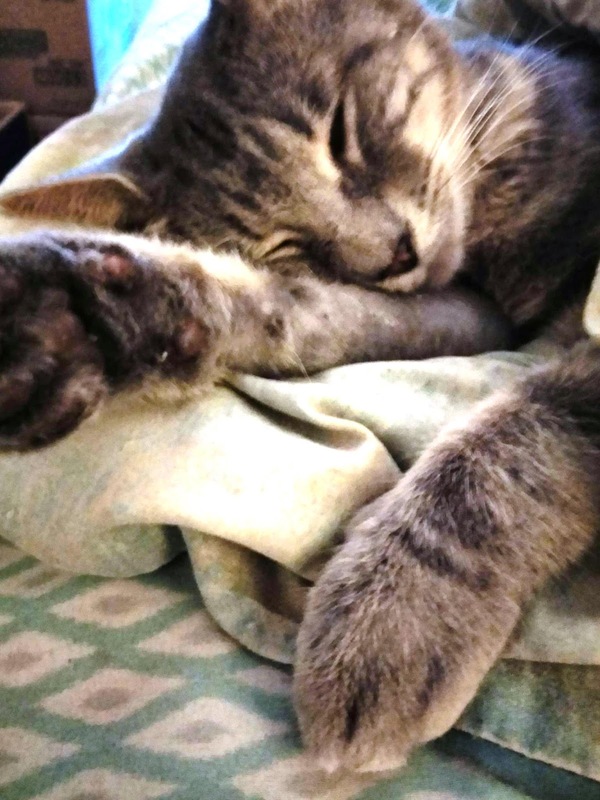 In spite of their heroic efforts, medications and syringe feedings, four of the kittens died, but Lori took the other two home with her and began to nurse them back from the brink of death. Because of the infections, the kittens had not yet been able to open their eyes, but after medication and Lori's loving care, they did at last open their eyes for the first time, and it was Lori that they saw. Lori's intention was to foster them while she nursed them back to health and then make them available for adoption, but with their numerous health problems including corneal ulcers, permanent respiratory problems and special feedings, she knew they would have to go to someone special. As time passed and her bond with these two kittens deepened even further, it became clear to her that she would not be able to let them go anyway. They sleep with her, lay in her lap, watch TV with her and listen to her every word. These two boys were family now, and she named them Weasel and Hawk. That was two years ago. Weasel and Hawk have now grown up and thrived in their home with Lori. They stay inside the house and the catio at all times, but recently, the catio door was left open too long, and Weasel shot out the doorway and was promptly chased up a pine tree in the back yard by one of their dogs. 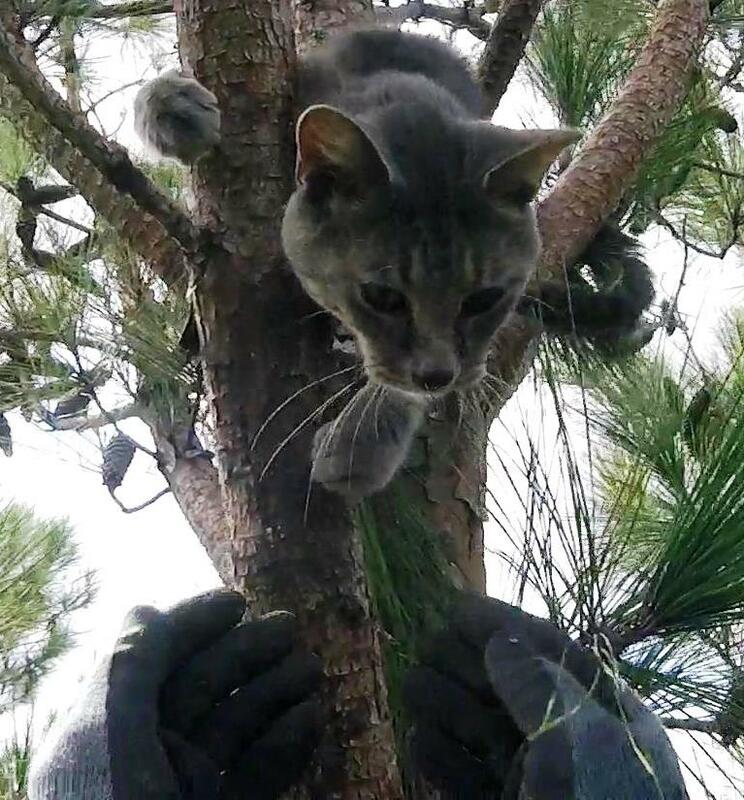 Weasel had never been outside before, much less in a tree, and he was out of his element. It quickly became clear to Lori that Weasel didn't know how to climb down and was stuck up there. 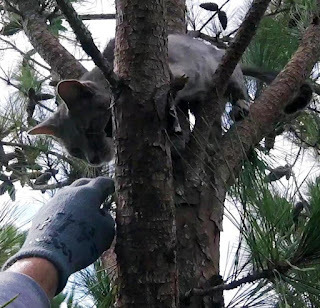 Weasel cried to Lori below, and she and her husband, Keith, did everything they could to get Weasel down, including making their own ladder using pine branches. They placed several cushions on the ground beneath Weasel in case he fell. They even found a place where they could rent an exceptionally tall ladder for an outrageous amount of money. Of course, they called the fire department and tree service companies in their coastal Mississippi area, but no one could help. 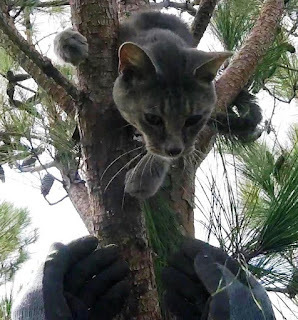 Then they found Bob Reese, the renowned cat rescuer of Mississippi, but he was located in Starkville, and they were located far out of his usual range. In spite of the distance, Lori contacted Bob anyway and learned that he was not available, but he referred her to me instead. Lori contacted me, and I agreed to go out there the following morning, after Weasel's second night in the tree. 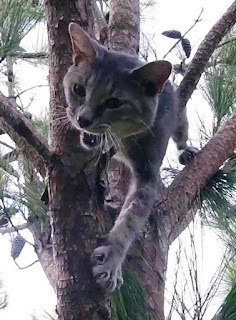 By the time I arrived, Weasel had climbed all the way up to the top of the tree. He was now about 55 feet high, and he could not go any higher. Fortunately, the pine tree appeared healthy and was large enough to support me, so I should be able to get close to him. Combine that with Weasel's friendly nature, and the rescue should be straightforward. I tried to set my line up high in the tree below Weasel, but I ran into some difficulties and ended up having to set it about 30 feet high instead. I climbed my rope up to that point and then began working my way higher up the tree until I was within reach of Weasel. I extended my hand up to him and he readily sniffed it. This introduction was a mere formality to him, because he was going to be friendly and happy to see me no matter who it was. He was resting his body across three small limbs, and I needed to get a little higher to lift him off his perch. I took a few minutes to get higher, but Weasel was getting a little impatient and made a little effort to come down to me, sometimes putting his paw on my hand. He did not want to miss this chance for a ride down, and he was not going to let me go without him. With him just above my head, I decided it would be safest to let him walk into the carrier. I pulled up the carrier, opened the door and held the open end up to him. He looked inside, determined it to be satisfactory and stepped inside. I pulled him down, closed the door and secured him to my harness. This little boy was safe now, and it's time to take him home. I brought him down and gave him to Lori and Keith. They took him inside and released him there, and they were both very relieved and appreciative. It had been a stressful three days for them while they worried about their kitty in the tree, and now it was over. I packed up and drove home while Weasel settled back into his routine. He is getting great care and attention there and enjoying being back in the comforts of home. Lori sent this picture to me later showing him sleeping peacefully in his comfortable bed. That is such a welcome and satisfying contrast to the sleepless discomfort of the tree. Sleep well, Weasel. And please stay inside. 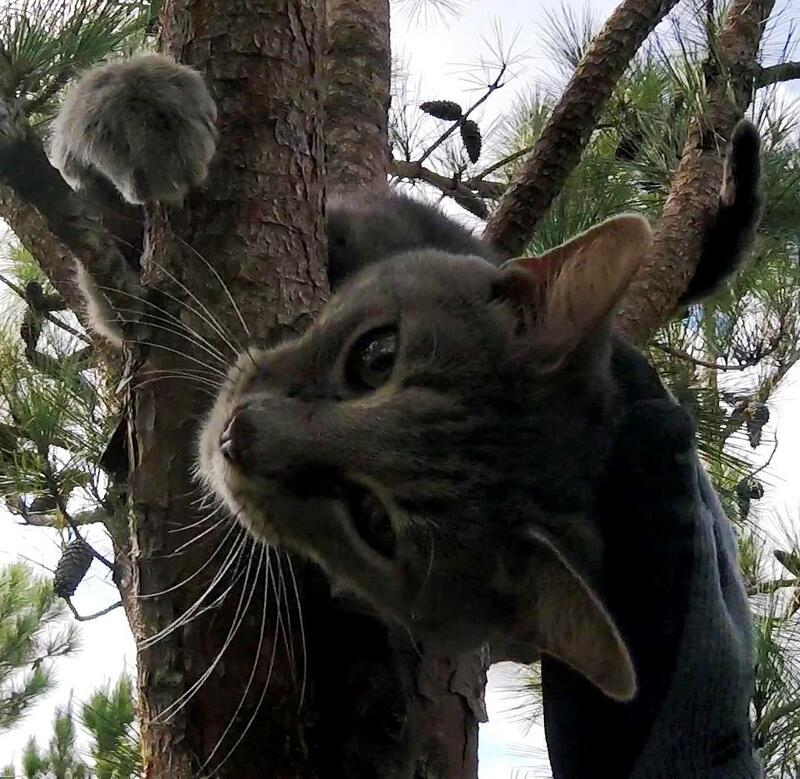 Why Do Cats Get Stuck in Trees?